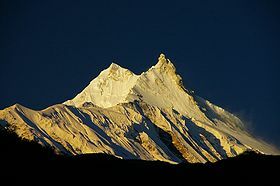 ... 1974, Naoko Nakaseko, Masako Uchida, Mieko Mori, and Jambu Sherpa became the 1st all-woman group to reach the summit of the 8th tallest mountain in the world -- the 8,100-plus-meter Manaslu (left), in the Himalayas. In fact, theirs was 1st women's group ever to ascend a mountain above 8,000 meters. The next day Sadako Suzuki, a member of a different group among the 13-member Japanese women's team, fell to her death; her body was never found.